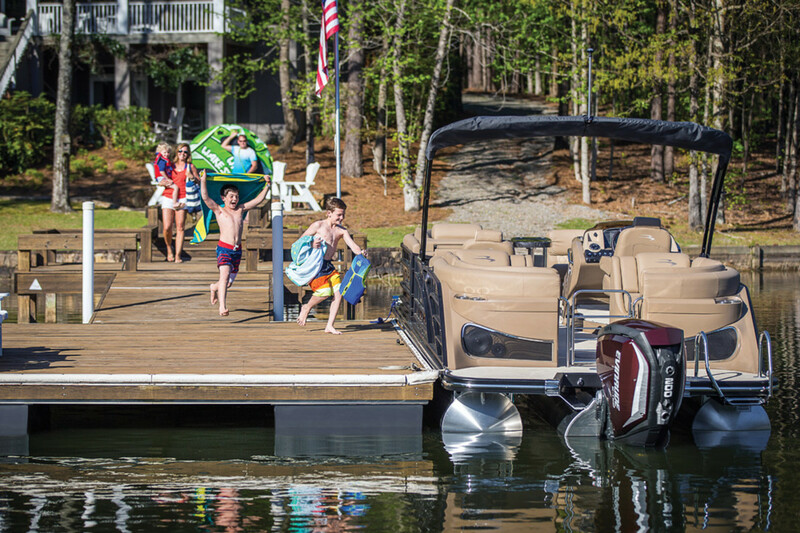 A pontoon boat doubles as a water playground. The pontoon segment continues to make big gains year over year as builders add power to the boats, broaden dealer networks, add options for saltwater markets and continue to attract entry-level boaters. The segment’s popularity also seems to be growing among grandparents, who are trying to draw adult kids and young grandkids to on-the-water gatherings. And sales data show that pontoon owners own second boats or personal watercraft at higher rates than those in many other segments, using the boat as a mother ship for gatherings — similar to what a yacht owner might do, but on a much more manageable budget. The versatility of the boats also continues to be a huge selling point, as higher-horsepower outboards give families the ability to day-boat, fish, pull tubes or skiers and add other toys, such as floats and slides, to create water playgrounds. Of the 250,000 new boats sold last year, new pontoons were the second-highest-selling category, with 48,564 sold in 2016 — a 9.4 percent increase from a strong 2015, according to data from Statistical Surveys Inc., another company that tracks boat sales. The only category ahead was the expansive outboard fiberglass boat segment, which captures data on boats from 11 to 50 feet (50,087). This year pontoons had a particularly strong April as sales rose 11.2 percent, to 3,236; in May, pontoon sales rose 7.5 percent from the previous year, to 4,741. Pontoon devotees say there’s no better way to get the whole family out on the water for a day of fun. Fort Myers, Fla.-based Juli Kern and her husband, Kevin, are lapsed PWC owners — “We sold them as soon as I got pregnant because we knew we wanted to have a boat with a baby” — and bought a Sea Ray 185 Sport, Juli says. Eight years and two kids later, they traded the Sea Ray in for a 25-foot Bennington tritoon 2575 with a 300-hp MerCruiser 350 sterndrive. That was in 2014 and they haven’t looked back. The Kerns also scuba-dive and tube, so the pontoon is perfect for holding their gear, as well as getting in and out of the water without tripping over each other, she says. It has storage for chairs, floats, noodles, snorkel gear, sand toys for the couple’s 9- and 10-year-olds, towels and umbrellas. The Kerns used to go out with their next-door neighbors and their two PWC, but the neighbors — also in their early 40s with school-age kids — loved the Kerns’ boat so much, they sold the PWC and bought a pontoon instead, Kern says. Still, more than 40 percent of pontoon owners own another boat or PWC, Ellis says, with 15 percent owning one or more PWC, 10 percent owning freshwater fishing boats, 9 percent owning jonboats and 10 percent also owning fiberglass runabouts (roughly three-quarters of those are tow boats). There are 11.5 million registered boats and 8.5 million households that own a boat, Dammrich says, meaning, on average, there are 1.5 to two boats per boat-owning household. Ellis wonders whether pontoon dealers are taking advantage of the fact that many pontoon owners also own either another boat or PWC, and typically, a slew of inflatables and other toys. “We refer to the pontoon sometimes as the mother ship,” says Ellis, who has watched the trend during the past couple of years. “These are arguably higher-value customers for the boating industry because ... typically they are buying other boats to go with it,” he says. Westre Marine doesn’t sell personal watercraft — “so I probably wouldn’t be the best person for that information. There are definitely people who still keep their fishing boat and add a pontoon to what they have,” he says. 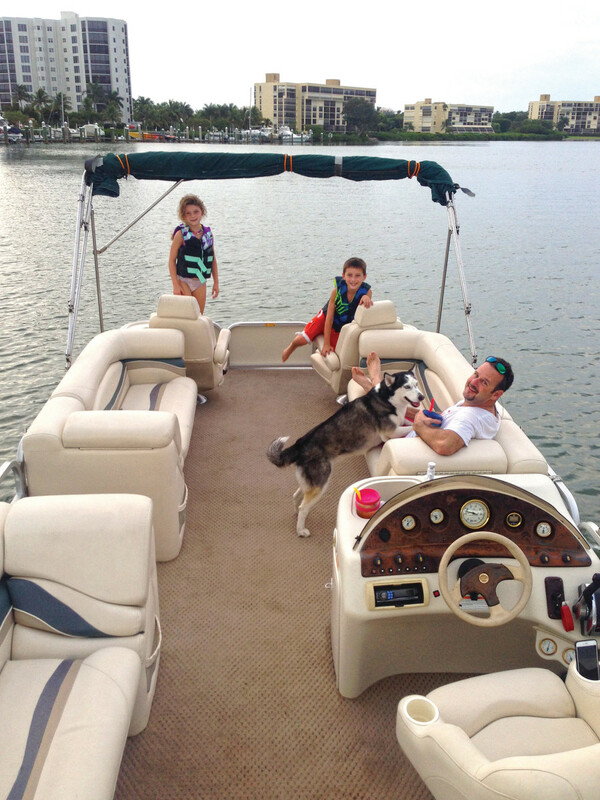 Kevin Kern is shown aboard his Bennington tritoon with daughter Kayli, 9, and son Dayton, 11. The platform appeals to a variety of ages because it’s easy to use, easy to move around in and is safe — exactly what the Kerns were looking for. “It’s more the entry-level boaters and younger people looking at smaller pontoons, as well as the tritoons,” Westre says, adding that he is seeing buyers of all ages. Ten years ago pontoons accounted for about 20 percent of his sales; this year, he says, it will be closer to 40 or 50 percent. “This is something fun that’s going to engage the kids and grandkids to visit. They’re excited to go to grandma and grandpa’s because they got a new boat,” Kloppe says. The grandparent economy is being seen in all industries, Ellis says, with grandparents making purchases even as their grandkids are the ultimate consumers. Lori Bitter, author of “The Grandparent Economy: How Baby Boomers are Bridging the Generation Gap,” said in an interview with seniorhousingnet.com (part of realtor.com) that the trend was born when grandparents stepped in to help their adult sons and daughters during the Great Recession. “Today’s grandparents are more of the opinion that … instead of leaving an inheritance, they want to enjoy that stuff with the kids and grandchildren while they’re alive,” Ellis says. Pontoon sales have grown about 20 percent every year for the past five years at Grand Pointe Marina. “I think it’s about ease of use, family time, everybody can fit, everybody can relax — I just think it’s a hot trend, especially if you have a place on the water,” says Stevens. Some of his customers elect to buy more budget-friendly options, but $100,000 pontoons are becoming commonplace, as well, he says. Another draw is how easy the boats are to use, Stevens says, and people love Tracker’s 10-year warranty. New boaters are increasingly coming in because of that ease of use — and have learned about them from a neighbor or friend who has a pontoon — similar to the Kerns’ neighbors. Benchimol’s only hesitation was the scarcity of the boats on Long Island Sound. “I was curious how they were going to do in this environment — it’s salt water, which is inherently where they’ve not been popular,” he says. He took on Bennington “because it’s the premier line” that could withstand the harsh environment, and he says this has been the best year thus far, but it is taking time and a lot of demos to show that the pontoons are capable of handling open water. The Kerns operate their Bennington in brackish water and salt water, launching in the mangroves and making their way through the maze to San Carlos Bay, and then to the Gulf. Juli Kern says spotting pontoons in their saltwater areas is common. Indeed, the rate of sales in the state has grown to 3,000, making it the fourth-strongest state, just behind Minnesota at 3,990 and Wisconsin at 3,021. The ones that do choose pontoons in his market could afford to buy whatever they want, but are sold on how many people they can put on the boat, the lower price point and the fact that they can still take it from Connecticut to Newport to Norwalk, he says.